When Murphy chose New York City, she left her first love behind. Now, a summer in Bridgewater means trading subway trains for pickup trucks and facing the boy she turned her back on. Leeda expects her trip home to be over faster than her new Manhattan boyfriend can hail a cab--until a surprising inheritance saddles her with a huge responsibility. Birdie's heart led her all the way to Mexico, and heartbreak brings her back to the orchard. But when the Darlington family decides to leave peach trees for palm trees, Birdie gets a crash course in letting go--and learning when to hold on. Together for another juicy summer, carefree Murphy, perfect Leeda, and big-hearted Birdie return to the place that allowed them to bloom. Brimming with all the charm, humor, and heart of Peaches and The Secrets of Peaches, this satisfying conclusion to the series reunites three unlikely best friends for a final sweet farewell. 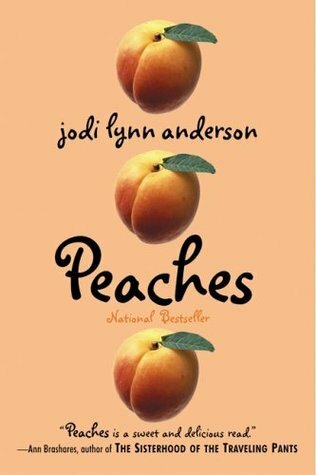 Jodi Lynn Anderson ends her tale of three Georgia peaches in the final book of the trilogy, Love and Peaches. Though it was nice to witness the end, I wanted more. I didn't feel satisfied with the way everything wrapped up. I needed more juice, more meat, more peach fuzz. Did I go too far with that analogy? Okay, I needed more details! The first two books were detail specific and Anderson gave readers every ounce of information. Disappointingly, the details in this installment skimmed the surface and disappeared before I could even get a handle on them. Murphy comes home to Bridgewater and the summer leads up to an absolutely life changing moment. Her mother knows who her father is and refuses to tell Murphy. Add that problem to the fact that Rex, her ex-boyfriend, is leaving town and wasn't even going to tell her and you get one emotional Murphy who struggles to show it. Readers will connect with Murphy through her uncertain feelings for her ex. She does still love him but doesn't know what to do with that love since she's always dreamed of living in NYC. Readers will also strongly empathize with Murphy in her desire to know her father. Leeda returns for the reading of her Grandmother's will and plans on returning to NY very quickly. But her Dear deceased Eugenie has other plans for Miss Leeda as she inherits her pet ponies. Her task is to use her $500,000 inheritance to take care of the ponies until new homes can be found for all of them. Then the rest of the money is hers. With this rather large kink in her plan, Leeda must remain and take care of the ponies and the other animals who show up on her doorstep with the help of Grey, a wandering eighteen year old who her grandmother hired. Readers will learn more about Leeda in this book, including her love for animals. She becomes more focused, dedicated, and open to the world in this final novel which will undoubtedly allow readers to make a deep connection with her. Birdie experiences quite a bit in this short book. She becomes engaged, runs away from her fiance, lives in a tree house, works the orchard for the summer, tries to return to her fiance and finds herself without a home. Like I said, quite a bit. Though most of the situations are briefer than they should be based on the seriousness of the action, readers will discover a deeper side to Birdie and witness her bloom into adulthood as she goes through these trials. The plot is well organized. All three girls return to Bridgewater on summer vacation and the story shares their summer of discoveries and loss. In the epilogue, Anderson shares what each girl goes on to do, which I highly appreciated. However, with a certain personality I had a hard time believing that her life would be like that. Maybe it's just me. I definitely enjoyed reading about what happened to the peaches but I wanted more from the third book. I expected more. And I was a little let down.